AGATHO and TRIPHINA, martyrs in Sicily during the Diocletianic Persecution. The date of their martyrdoms is placed as circa 306, no further information is extant. EDANA (ETAOIN), (Date Unknown), St. Edana received tonsure from St. Patrick (17th March), she lived for some time at the junction of the Rivers Shannon and Boyle, and is the patron of several parishes in the west of Ireland. St. Edana later travelled to Scotland where she founded a convent. There is a tradition that the city of Edinburgh in Scotland is named for her; “Dùn Édana”, meaning “Edana’s castle” or “Edana’s fortress”. She is also thought by some to be the same saint as St. Modwenna of Whitby (vide infra) though there is no documentation to support either of these assertions. ERFYL (EURFYL), (Date Unknown), a Welsh holy virgin, St. Erfyl founded, and is the titular saint of, a church at Llanerfyl, Powys, Wales. According to local tradition, she is buried beneath an inscribed stone in the churchyard, and her holy well once stood nearby. FRAGAN and GWEN (BLANCHE), (Fifth Century), the parents of SS. Winwalöe (3rd March), Jacut and Guithern (8th February). SS. Fragan and Gwen fled the chaos in Britain following the departure of the Romans. They settled in Brittany, where there are several churches dedicated to them. MODWENNA, the successor of St. Hilda (17th November) as Abbess of Whitby in England. Other details of her life are hopelessly intertwined with those of St. Modwenna of Polesworth (vide infra), and in some menologies with those of St. Edana (vide supra). St. Modwenna reposed circa 695. MODWENNA, this St. Modwenna, who flourished in the seventh century, is believed to have been an anchoress, and later Abbess of Polesworth in Warwickshire, England. The recorded details of St. Modwenna’s life have become impossibly muddled with those of St. Modwenna of Whitby (vide supra), and in some menologies with that of St. Edana (vide supra) that it is impossible to state beyond doubt, anything but the most basic particulars. NUMERIAN (MEMORIAN), the son of a wealthy man in Trier, and disciple of St. Arnulf (18th July). St. Numerian received monastic tonsure at Remiremont Abbey, and later spent time at the Abbey of SS. Peter and Paul of Luxeuil. In 645 he was consecrated Bishop of Trier serving as ordinary until his repose circa 666. PHILOMENA, a saint venerated in San Severino near Ancona in the Italian Marches. The only information extant on St. Philomena is an inscription on a tomb, discovered in the thirteenth century, which gives her name and that she must have flourished prior to 500. PROBUS and GRACE, (Date Unknown), Cornish Saints who are traditionally thought to have been husband and wife. The village of Probus in Cornwall takes its name from St. Probus, and its church, St. Probus and St. Grace, is dedicated to them. STEPHEN of REGGIO, (First Century), traditionally believed to have been consecrated the first Bishop of Reggio by the Apostle Paul (29th June) and martyred in the persecutions during the reign of Nero (r. 54 – 68). TRIPHINA, (Sixth Century), the mother of St. Tremorus (7th November), the infant-martyr. After her son’s martyrdom, St. Triphina spent the rest of her life in a monastery in Brittany. ZÖE (ZOA), the wife of a high-ranking official in the imperial court in Rome. 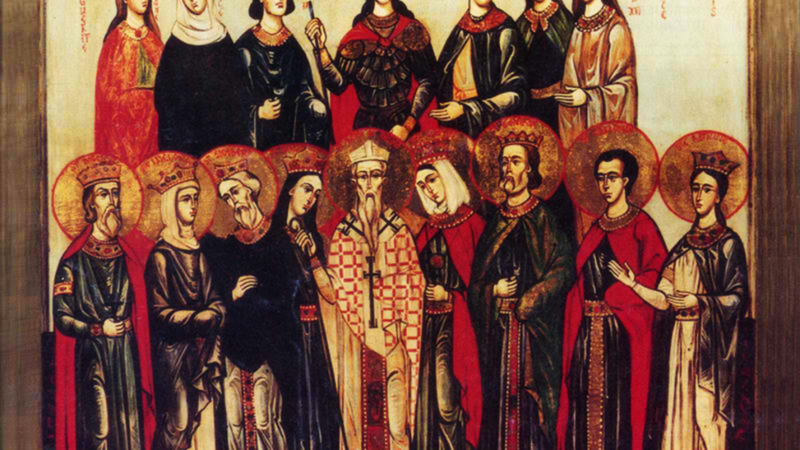 St. Zöe was arrested, tortured, and finally martyred for her faith circa 286.